In a medium frying pan, heat olive oil and sauté onion until tender, about 5 minutes. Add garlic, and sauté for 1 minute. Stir in tomatoes, capers, black olives, chillies and parsley. Bring to the boil, and simmer for 10 minutes. Spread a couple spoonfuls of the sauce in the bottom of an 18x28cm (7×11 in) baking dish, and arrange fillets in a single layer in the dish. Drizzle lemon juice over the fillets, and then pour the remaining sauce over all. Bake for 15 to 30 minutes, depending on the thickness of your fillets. Baste once with the sauce while baking. Fish is done when it flakes easily with a fork. 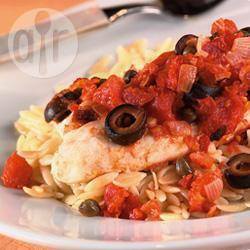 This recipe also works great with, cod, mackerel, swordfish, halibut and skate.